Despite Prime Minister Atal Behari Vajpayee and Deputy Prime Minister L K Advani’s meetings with former Gujarat Home Minister Haren Pandya for ensuring a smooth election campaign in the state, the BJP appears to be on a sticky wicket as Chief Minister Narendra Modi’s “arrogant and authoritative” style has put a damper on the enthusiasm of party workers and sympathisers. 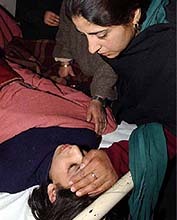 A relative of Nazia Ayoub attends to her at a local hospital in Srinagar on Saturday. Nazia was among five persons injured in a landmine explosion on Saturday afternoon. Delimitation panel showing undue haste? LUDHIANA: Selective demolitions by district administration? EDIT: Will contract jobs in universities & colleges help stem the rot? Sir, this file says nothing about Gujarat. Do you really want it? The Chief Minister of Punjab, Capt Amarinder Singh, today denied that the filing of a challan in a corruption case against his seniormost Cabinet Minister, Mrs Rajinder Kaur Bhattal, in a court here yesterday was due to vindictiveness on his part. At least 38 persons, including women, were killed when a passenger bus in which they were travelling fell into the Chenab today. As many as 20 passengers were injured. The police said the bus, carrying 57 passengers, was overloaded and was on its way to Marmath from Doda. The Punjab Government has suspended Chief Engineer, Sukhjinder Singh Sandhu, Superintending Engineer, Jarnail Singh, and Executive Engineers Gurmail Singh and Anil Khosla in connection with a multi-crore scandal pertaining to the Upper Bari Doab Canal remodelling project of the Irrigation Department. Six Pakistanis and three Somalis were among 12 persons held in Kenya in connection with anti-Israeli attacks that left 16 persons dead near Mombasa, the police said. Russian President Vladimir Putin’s 38-hour-long visit to India beginning December 3 evening will mark a watershed in the emergence of a new India-Russia-China axis and is bound to take Moscow-New Delhi strategic ties to new heights. The 144 Sawra-Kuddu power project will be executed jointly by four partner states of the Bhakra Beas Management Board and the Himachal government. The decision to take up the project as a joint venture was taken at a meeting of the state Cabinet held under the chairmanship of Mr P.K. Dhumal, Chief Minister. Words don’t live in dictionaries, they live in the mind!